Over the last two months, an alarming assault has been waged on the Amazon and its people. Amazonian communities and Brazilian civil society are mobilizing. It’s time for us to ramp up international action to defend the Brazilian Amazon. Watch this striking video and sign up to organize an action today! Despite local, national and international outcry, the Brazilian government approved construction of the disastrous Belo Monte Dam, ignoring social and environmental considerations. Heavy machinery is now breaking ground on the banks of the Xingu River. Brazil’s Congress voted to gut their Forest Code, leading to a huge spike in deforestation. Forest guardians have been victims of murder and intimidation and little is being done to protect those still living at risk. 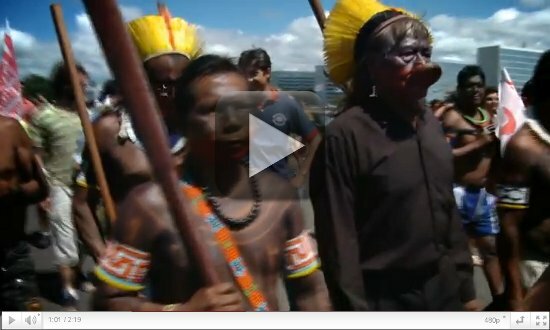 Brazil needs to respect the order issued by the Inter-American Commission on Human Rights to stop all construction of the Belo Monte Dam; Brazil’s president should veto the new Forest Code; forest guardians should be protected and justice needs to be served for those who have lost their lives. Help bring these messages to the Brazilian government by organizing a solidarity action at the Brazilian Embassy or Consulate nearest you on August 22nd. Protests have been growing throughout Brazil and around the world. Saturday, August 20 will be massive day of action in at least 22 Brazilian cities, including Altamira, Rio and Sao Paulo. Let’s stand in solidarity with them to defend the Brazilian Amazon, indigenous and local community rights and our global climate. This is a defining struggle of our times; the assault on the Amazon must stop! Together we can make a difference if we act now. Watch and share our video and sign up to organize an action today. If you can’t organize an action, but want to find out where they will be happening, join the Facebook event. Xingu Alive Forever! Xingu Vivo Para Sempre!